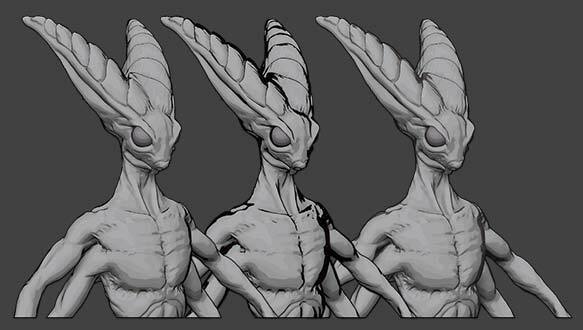 In addition to posterization, ZBrush provides an alternative (or supplementary) way to create the characteristic edge lines visible in cell shading. In the Material > Mixer you can find the Outline and Depth settings. These are located just below the Posterize slider. The Outline slider defines the intensity of the outline color, based on the object’s diffuse color. The Depth slider defines the detection of breaks in the model’s curvature in order to calculate the width of the outline. These outline settings are also available as BPR filter modulators through the Edge detection sliders.